Once you purchase a car, you soon realize that there is more to driving than just turning on the ignition, engaging the gear, and having your foot on the gas pedal. You need to learn what is underneath the car so that you can handle any emergencies as they arise. One vital component of a car’s driving mechanism that you need to be familiar with is the driveshaft. The purpose of the driveshaft is to transfer torque from the gearbox to the wheels. 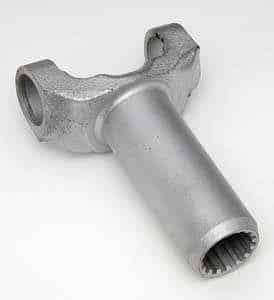 If you are driving a front wheel car the driveshaft will consist of an inboard velocity joint; an outboard fixed joint and the connecting shaft. Within the driveshaft, the CVJ shafts are constantly exposed to stress as well as high temperatures due to the displacement angles. Most of the time when you have problems with your driveshaft you will hear a knocking noise whenever you are making turns around corners or accelerating. You will often find the driveshaft in most rear-wheel cars. The purpose of the driveshaft is to transfer torque from the engine to the wheels. The output shaft is the one that rotates, and this spins the driveshaft. The differential ring then rotates the wheels. If the driveshaft has problems, you will not be able to drive your car effectively. This is how to identify a faulty driveshaft. Inside the driveshaft are bearings and bushes that help in the rotation. With time these wear out, and you will start an abnormal noise coming from the driveshaft. The noise can be a composition of rattling, scraping or clunking. The u-joint that support the driveshaft will need to be checked for wear. You should take your car for mechanical repairs when this happens. It is normal for the car to vibrate a little, however, when the vibrations are intense something can be wrong. This can be caused by the driveshaft u-joints and bearings wearing out. Driveshaft are designed to be evenly distributed underneath the car. This ensures that they do not vibrate unnecessarily. Vibrations can cause a further tear of other driveshaft parts due to unbalanced weight. The driveshaft is central in driving the car. If you have problems turning the car around corners then your driveshaft could be having problems. This can be dangerous when you are driving in high speeds. Maneuverability is crucial if you are going to avoid collision with other cars. If you find the car shuddering whenever you try to accelerate under low speeds you could be having problems with your driveshaft. This could be due to a worn out bearings or u-joint. How long does a driveshaft last? The driveshaft delivers the torque to the wheels. Rear-wheel drive cars use it to send power to its wheels while front. Four-wheel drive cars often have more than two driveshaft which makes them harder to maintain. The driveshaft has a limited lifespan like the car. Once it starts wearing out you have problems with power being distributed to the wheels. A faulty driveshaft puts pressure to other parts of the car. It is approximated that a driveshaft will have a lifespan of around 75,000 miles before it becomes completely worn out. However, this will largely depend on car usage and terrain. Cars that have had their height adjusted tend to have damaged driveshaft. If you want to ensure you’re your driveshaft lasts longer lubricate the u-joints and bearings the moment they start showing signs of wear. You will know that they need changing the moment you begin hearing a squeaking sound from underneath the car. Have your driveshaft inspected the next time you take your car for service. If you have two or more driveshafts, you will need the center bearings to offer support. The bearing is attached to the frame cross member. The bearings need to be well lubricated due to the amount of friction that they handle. If the driveshaft is experiencing too much drive angle, it will put unnecessary pressure on the central bearings. Moisture coming into contact with the area can also damage it. 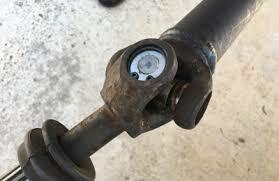 You will know it is time to repair your driveshaft when your notice rust forming on the joints or when you hear a clicking sound whenever you engage drive with the car brake on. The first of repairing a faulty driveshaft is phasing. This is marking the yokes so that when you are replacing the driveshaft, you will have perfect alignment. Should you choose to use a split shaft ensure that you have marked the shaft before your split it. You need proper tools to remove the driveshaft, and you should not attempt this if you lack proper training. Check the thrust washers, propeller shaft yoke, link yoke, socket ball for wear and tear. You should realize that not all the noise produced by a car could be a result of the faulty driveshaft. A small vibration is normal for most cars. To avoid further problems with your driveshaft ensure that you purchase tires that are of the same size – at times even the same make. This is because tires have a different circumference. The exception would be the spare tire – which you do not expect to use for long distances. When driving ensure that your tires are well inflated with the same tire pressure. The tear should also be even amongst all your tires. If you need to replace them do it for all tires. This will prevent uneven weight being distributed to the worn out tires. The noise produced by a faulty driveshaft is often clear when you are moving through flat, tarmacked surfaces. The driveshaft plays an important role in transferring power from the engine to the tires. If you notice that the car is vibrating more than usual or you have trouble turning corners, then the driveshaft could be having problems. 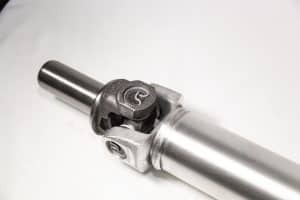 A good driveshaft should see you through more than 75,000 miles, but you will need to change and lubricate the movable parts like bearings and U-joints.